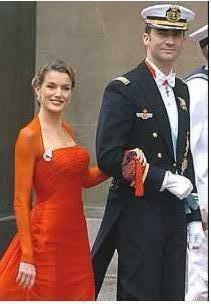 Royal-fever is starting to catch on here in as the wedding between Prince Felipe and Letizia nears. Security in Spain is tightening up because of possible terrorist threats and one of the measures announced by the Government is to suspend as from today Spains participation in the Schengen Agreement. This agreement allows nationals from the following countries to move freely from one country to another, without having to produce identification on arrival at airports: Spain, Belgium, Germany, France, Luxemburg, the Netherlands, Italy, Portugal, Greece, Austria, Denmark, Finland, Sweden, Norway and Island. From today however, and until 24th May, people travelling between these countries will be required by Spanish authorities to carry an ID card or a passport. Also, no light aircraft will be allowed to fly over Madrid from the evening of 21st May to the evening of 22nd May. Yesterday Letizia and Felipe attended the royal wedding in Denmark and the Spanish media examined from every angle possible Letizia’s first appearance in a royal event (see photo above). As always, she showed herself to be very confident infront of the camaras (she used to be a television reporter and a news reader) and the Spanish commentators seemed very satisfied with her performance. According to TeleCinco, the wedding in Madrid is expected to cost about 5 million euros (including the cost of repairs to the Almudena Cathedral where the ceremony is to be held, security measures and the cost of sprucing Madrid up for the event). This figure does not include the cost of wine and cava which is a gift from the bodegas, or the lunch which will be paid for by the royal family. The evening before the wedding, two of Spain’s most famous chefs, Ferran Adria (to translate webpages from Spanish to English use one of these automatic translators) and Arzak whose respective restaurants are considered to be the best and second-best in Spain, will serve a dinner to guests. The weather in Spain is still quite unstable and experts say it may well be cloudy with showers next Saturday in Madrid.